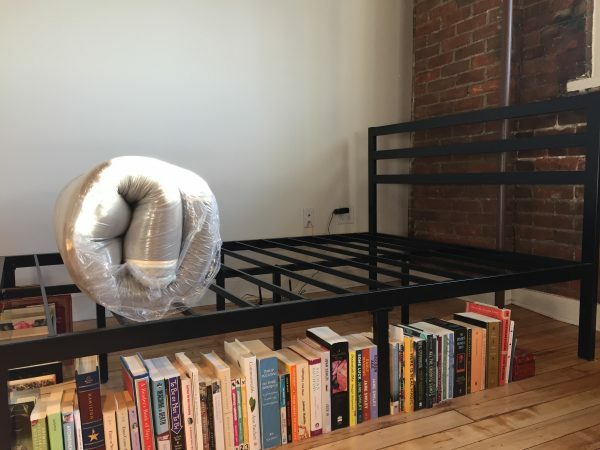 The Leesa mattress, ready to be unfurled. NICOLE: Technically it’s Tuesday afternoon! NICOLE: But it’s Black Friday when people will read this! NICOLE: You don’t know that. They might read it on Small Business Saturday. Or Cyber Monday. Or some random day in 2019 when they follow a link to this chat in a post we haven’t written yet. NICOLE: It is Black Friday IN OUR HEARTS. NICOLE: That is the worst thing to be in a heart. NICOLE: Unlike many Americans, we are not shopping today. NICOLE: I mean, I don’t think we are? The day hasn’t happened yet. NICOLE: But we would like to tell you about some of the things we’ve bought recently. NICOLE: Or, like, over a month ago. NICOLE: We are the editor of The Billfold and we get to decide what time means, okay? Today is Black Friday and we bought our new mattress recently. NICOLE: We bought our new mattress on October 11. Also, you kinda spoiled the reveal. NICOLE: Sorry. We bought a Leesa mattress. On October 11. For $705. We also got a free Leesa pillow. NICOLE: Tell ’em why we bought the mattress. NICOLE: So you remember that other mattress? The $191.53 (discounted from $660) mattress that we ordered when we moved to Cedar Rapids but accidentally got shipped to Seattle instead? It turned out to be a lemon. NICOLE: There was a person-shape in the mattress within two months. NICOLE: And the return deadline was one month. NICOLE: So we flipped the mattress over and that didn’t work, and then we spent $102.24 on a featherbed topper to go over the mattress and that worked for a while, and then we trained ourselves to sleep on our back instead of our side because that meant our hips wouldn’t press into the coils, and then we couldn’t even sleep on our back because the coils were digging into our tailbone. NICOLE: This mattress was the worst. NICOLE: So we told ourselves we would wait until our birthday to get a new mattress and then we couldn’t wait any longer and we bought the Leesa. NICOLE: Which is amazing. You put your body on the mattress and it just holds you. Highly recommended. NICOLE: The Leesa pillow… not so much. NICOLE: If you like soft, squishy pillows, you’d probably love it! NICOLE: But we like big thick pillows that fill every bit of space between our shoulders and our head. NICOLE: And we loved the Leesa mattress so much that we wanted a pillow that felt exactly like the mattress. NICOLE: We tried using the pillows we already had with the Leesa, but it felt like having your body supported on a perfect sleeping structure and having your head supported on a continually sinking pile of feathers. NICOLE: So we made an “emergency” trip to Bed Bath & Beyond and bought a Tempur-Pedic Tempur-Cloud pillow, which is also highly recommended. NICOLE: It is not like sleeping on a cloud at all. It is like sleeping on a very firm structure with just enough give to support your head without letting it drop into the pillow. NICOLE: Kind of like sleeping on Play-Doh. NICOLE: Or a pillow-sized Leesa mattress. NICOLE: So that’s the story behind the big purchase that we didn’t want to tell you about right away, because we were kinda hoping to work out some kind of Billfold thing-thing with Leesa. NICOLE: Maybe we should ask Tempur-Pedic instead. NICOLE: We just compared their pillow to Play-Doh, though. NICOLE: In a good way! NICOLE: Let’s deal with our next round of sponsorship pitches after the holiday. Right now, we should tell The Billfold about our plants. NICOLE: We have more plants! A rubber plant, a calathea plant, and a new jade plant to take the place of our poor etiolated succulent that we tried to trim and replant but ended up killing. NICOLE: We are the best with plants! NICOLE: Of the three plants we bought when we moved into our apartment last year, one is still alive! NICOLE: That is why we bought a second jade plant! Because we kept the first one alive for a year! NICOLE: We spent $81.32 on the three plants and their pots, so let’s try to keep them alive too. NICOLE: Any other updates we need to share? NICOLE: Tell ’em about the bike chain. NICOLE: Oh, right. So… we tried to put the chain back on our bike, but we couldn’t do it, so we took it to the local bike shop and the staff told us that the chain was wedged between the spindle and the crank wheel, and they had to take the crank wheel off the bike to fish the chain out. NICOLE: So it wasn’t our fault that we couldn’t do it ourselves! NICOLE: Then they put it all back together again and didn’t charge us anything because we bought the bike from them and minor repairs are free. NICOLE: Be thankful for local bike shops! NICOLE: It’s still TUESDAY AFTERNOON. Thanksgiving hasn’t happened yet, and I can be thankful for as many things as I want!